For years I’ve had this thought that keeps circling in my head: If I wasn’t doing my style and wardrobe consulting with clients, I’d want to work with the families of returning vets. Our soldiers and their families pay such a price serving our country. Somehow I’d like to help. But then I’d say, “Brenda, with your background, what on earth could you possibly bring to the table for these families?” No idea. So imagine sitting next to me in my office reading an email from Michelle Lerner from Chico’s headquarters in New York. 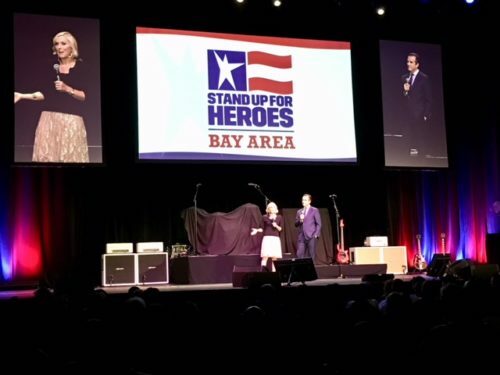 On 5.17, we are hosting a gifting suite to support female veterans and caregivers, as part of our partnership with the Bob Woodruff Foundation, for their first ever Stand Up For Heros event in the Bay Area. The gifting suite will contain accessories like wraps, bags and jewelry. The idea is to give the female veterans and caregivers a truly VIP experience. There would be 25 or so women stopping by in all. We thought it would be really interesting to work with you on this, if you have any interest. 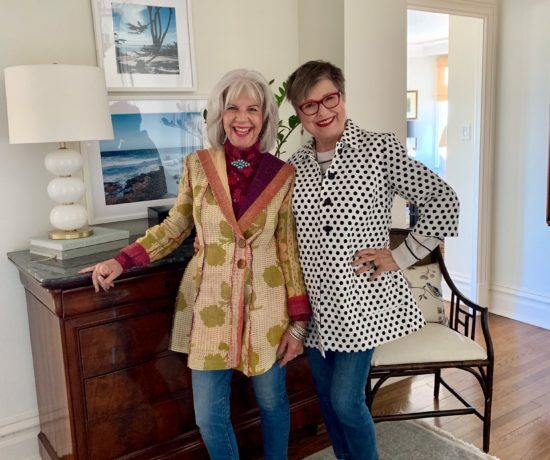 The idea would be that you could go and help the women style their outfits with the pieces in the suite. If I have any interest! I was over the moon. My response had lots of capitalized words in it like LOVE, LOTS, YES, and I’M IN. 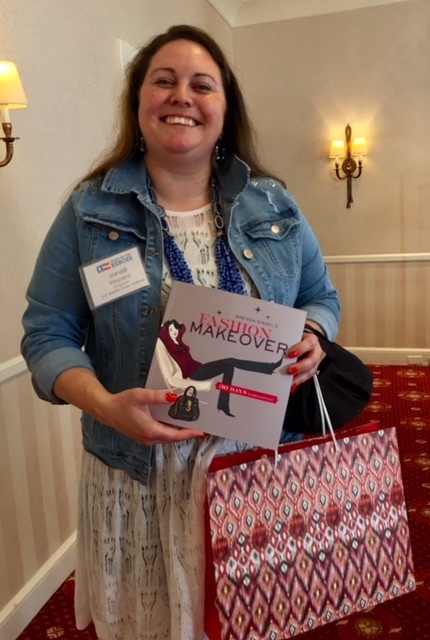 I offered to bring copies of my books and suggested that if there was time I could do a little style work with women who were interested in that. Dad and I talked about Bob Woodruff. Do you remember when he and Elizabeth Vargas became co-anchors of ABC’s World News Tonight taking over after Peter Jennings died? We do. He was six weeks into his dream job and reporting live from Iraq. It was my Dad’s birthday, January 29, 2006, when the armored vehicle he was in was hit by a roadside bomb. I come from a family who watches the 5:30 national news and reads newspapers every day. Like many Bob Woodruff fans, my heart broke for him and his family. He was in a medically-induced coma for 36 days and suffered traumatic brain injury (something I’d learn about personally many years later when Mother suffered a TBI) along with PTSD, and depression. 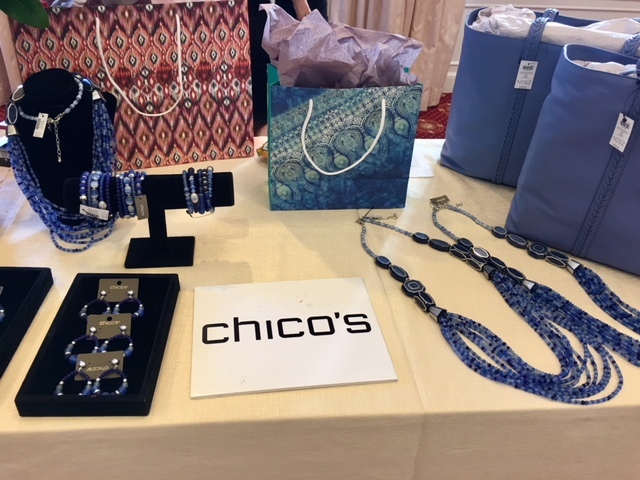 The main fundraising event happened in the evening but during the day about 26 female veterans and caregivers visited the Chico’s gifting suite. In the next room there were several stations set up for them to could get their makeup done by Dior beauty specialists. Our section of the mezzanine floor of the Mark Hopkins Hotel was buzzing with activity. 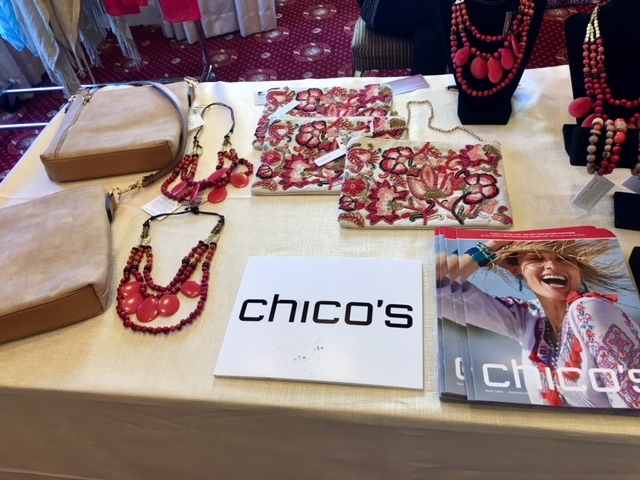 When women came into the Chico’s gifting suite they could choose a handbag, jewelry, and a wrap. There was the sand fringe wrap scarf as shown below on a Chico’s model, a great neutral. And the wild tuberose knit wrap that Mayra is wearing. Isn’t it gorgeous on her? You saw jewelry on the gifting table. Here are links to the blue collection of jewels: Blue Beaded Coil Bracelet & Blue Beaded Multi-Strand Necklace & Blue Beaded Drophoop Earrings. And the coral collection: Warm Multi Pendant Necklace & Warm Stretch Bracelet & Warm Drop Earrings. 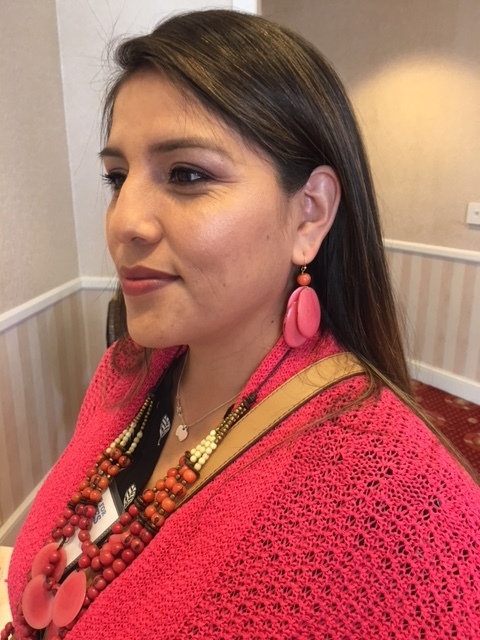 Here’s Janell wearing the blue necklace and earrings. I was so happy to run into her later that evening with her husband who survived a blast. She graciously shared her story with me. That smile! She glows. 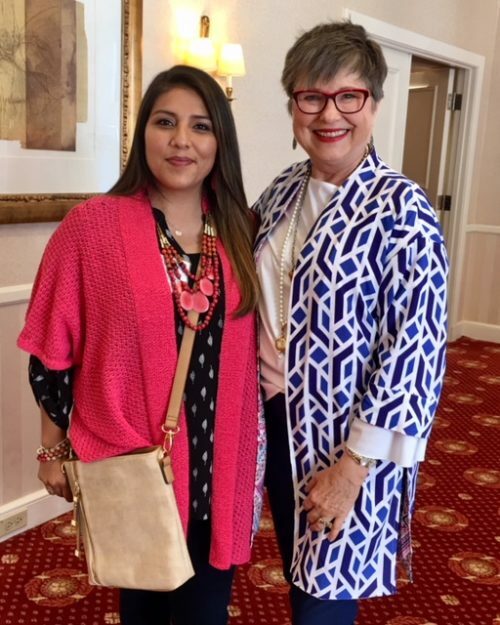 Mayra chose the coral jewelry group. The earrings were so perfect on her and I was excited to explain why. Do you see the smooth surface of her earring? Her skin is just as smooth and even-toned. Her hair is very smooth. I explained to Mayra how a woman with lots of freckles and curly hair wouldn’t look as great with this smooth earring. Something more patterned or textured or busy would look more authentic on that woman. Smooth, smooth; pattern, pattern. It’s a simple way to create harmony especially when shopping for items that will be nearest your face. Let’s talk handbags. There’s the smart neutral colored boho cross body bag that Mayra is wearing above. Note how smooth it is! It was perfect for her. But you knew already because of the smooth, smooth. I predict she’ll wear it everywhere. There’s the paisley floral clutch that Lee Woodruff chose. 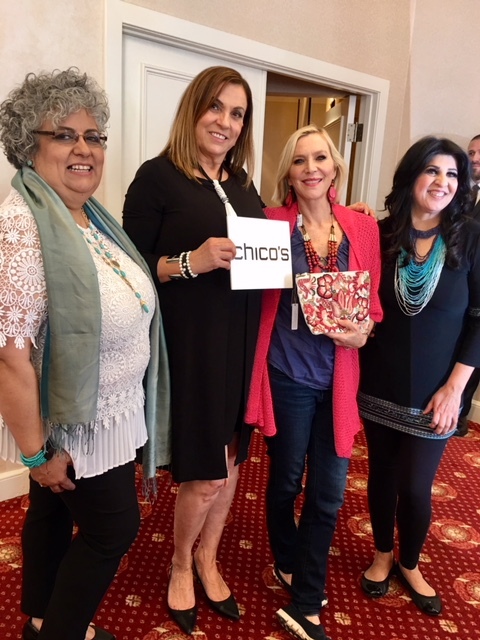 Here Lee, co-founder of the Bob Woodruff Foundation, is posing with the wonderful Chico’s women who helped the women in the gifting suite. 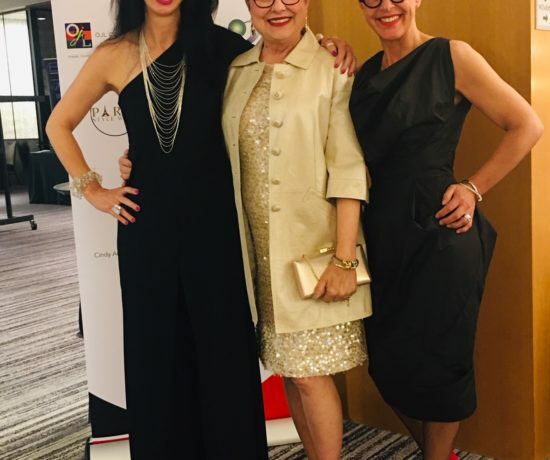 From left to right, please meet Ana Adrain, Imelda Nelson-Boruk and Koby Said. But Brenda, what about the blue tote? Sorry, it’s sold out. Here’s a blue nautical grommet’s tote that you might like if you’re shopping for a tote. In about five minutes I had the basis of her style recipe. 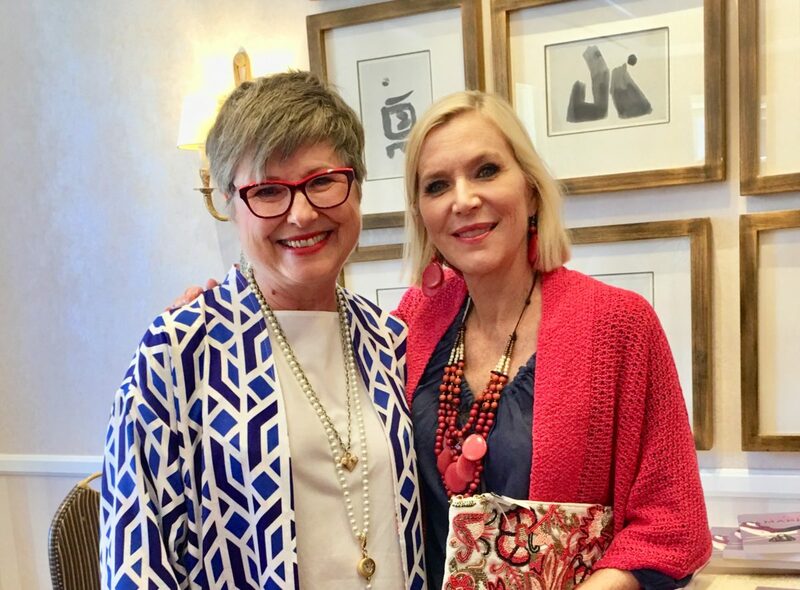 By describing a color to me, speaking about the qualities as if she were the color (“I am blue, I am powerful, I am…”), she was telling me about her personal style. 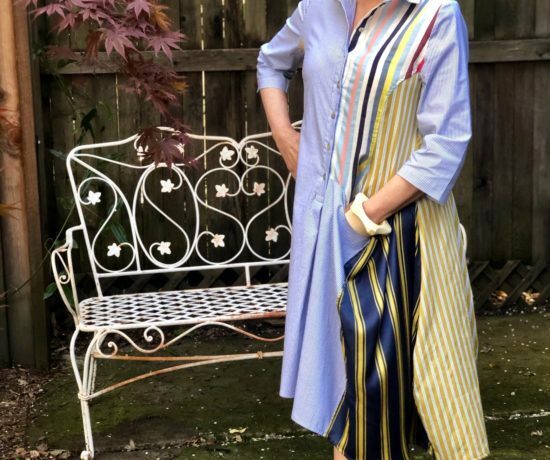 Her style recipe is understated, classic, powerful, and refreshing. It’s always tender doing this exercise because the person doesn’t realize she’s really describing herself. When I repeated the words to her, I asked Jenny if she would feel flattered if someone were to describe her using those words. She said, “It’s what I would aspire to be.” I told her she was already there. Now we’d work on getting her clothes to relate that message. I asked her to think about her wardrobe at home. She said, “It makes what’s in my closet make perfect sense.” She had enough of the understated and classic pieces but not enough things that spoke to the powerful or refreshing parts of her. She left with a copy of my book. Later that night at the public fundraising event at the Masonic Auditorium I ran into her and her husband. Her darling husband said, “Brenda, we were reading your book in our room. It’s good!” I tell you, getting that husband endorsement always warms my heart! Here’s another style exercise that’s simple to do. You can try this at home! The Bob Woodruff Foundation raises money and in turn provides funds to organizations that are doing great work for the veteran community. One of those is Bunker Labs. 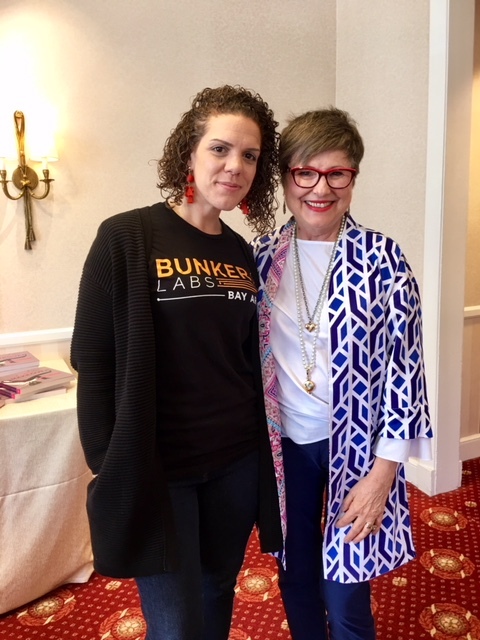 Bunker Labs is a not-for-profit organization built by military veteran entrepreneurs to empower other military veterans as leaders in innovation. Justine Evirs is the National Director of Policy at Bunker Labs. She’s quite a force! We talked about her work life which involves a lot of travel. She works directly with CEO’s and is often on stage. Orange is one of the brand colors and she always wants to wear something orange. I helped her brainstorm easy travel pieces she could work with plus other ways to bring orange into her uniform. See the orange fringe earrings she’s wearing? That was already in her toolbox! She’s worn long skirts in patterns that include orange. I suggested she also look at other items that could have orange in it like kimono style jackets. I suggested looking for full cropped pants or culottes (good for being on the stage) or jumpsuits for variety. I could even see her in an orange leather jacket. I told her to look for that kind of item on the sale racks. I turned her onto White House Black Market knit pants for comfort, something she’d alternate with jeans. And here’s something you need to know about Justine. She’s number seven on the 2018 list of the Mighty 25: Influencers Supporting the Military Community. Its a list of individuals making a difference for military service members, veterans, and their families. Want to guess who holds the number one spot? Dr. Jill Biden. I’d say they’re both in good company! Lastly I have to tell you about calling Dad afterwards. I told him what went on at the evening fundraising event, about what the Bob Woodruff Foundation is all about and shared some of the stories vets told on film and from the stage. 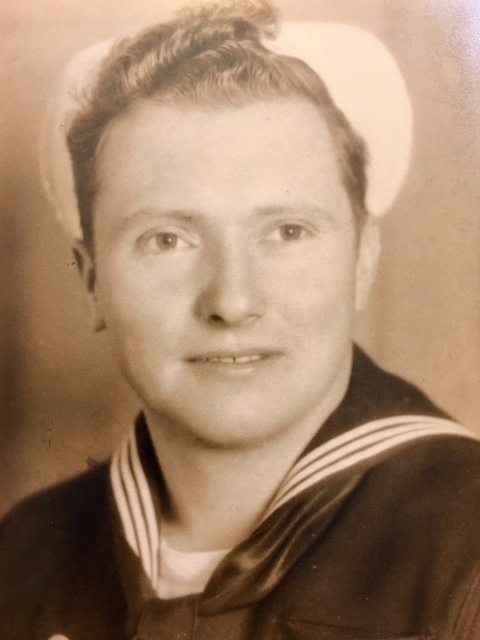 I said, “Dad, you would have cried.” Through sudden sobs he said, “Brenda, I’m crying already.” The sacrifices have been so great and although he believes there should be changes in our policies on war, we both agreed that it’s so important to care for our returning vets and their precious families. I’m so glad the Bob Woodruff Foundation is helping us help others. If you’d like to make a donation, go to the Bob Woodruff Foundation and take a peek at the top righthand corner of the website where it says Get Involved. Memorial Day is right around the corner. Will you help us remember those who have served? Will you share your story or something about your loved ones? Oh Brenda. Yet another reason to love and admire you! Oh my goodness! What a wonderful way to honor the veterans and families! Another reason to love you and your blog! Thank you so much for this! What an honor that you could help out with this Brenda!! 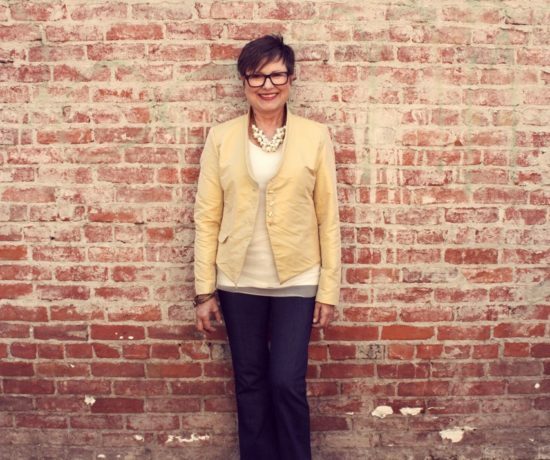 Brenda, such an honor and not only your Dad was crying… I was too as I read this! My soft heart failed me again! My wardrobe still needs a TON of help. I am often overwhelmed by choices and end up just finding something grey and something black and not accessorizing. I wish I could have attended the shindig! Thank you so much for doing this, Brenda! I feel strongly that all veterans deserve our attention and support. I’m the daughter of a two-time Purple Heart recipient, WWll veteran, and his German war bride! My dad served 30 years in the Air Force. For the first 18 years of my life I was an Air Force Brat, living in base housing, attending military schools, seeing families quickly come and go in our neighborhood. My first job after high school was serving food to the airmen at the base cafeteria! Of course my experiences can never compare to the brave, strong and resilient women who have served, or supported spouses who were stationed overseas, or welcomed home veterans who have been injured. This was a perfect fit for you, and I truly appreciate your efforts to support and honor the women of our military forces. Thank you! 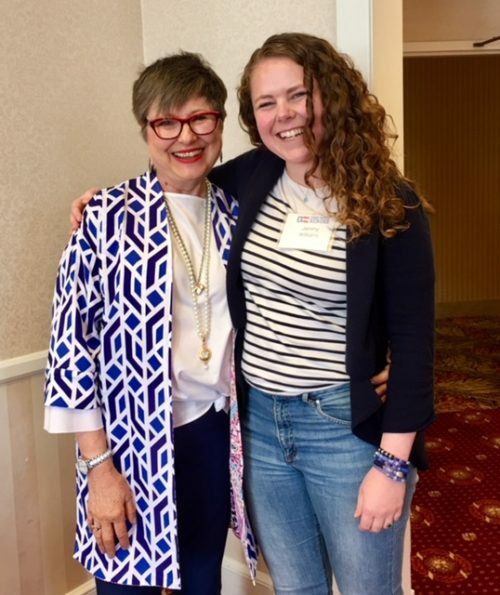 Isn’t it amazing how what we each bring to the table manages to connect us to opportunities where we can serve? Even if we can’t quite picture it in our heads, even if, as you said right off the bat, it seems so unlikely. 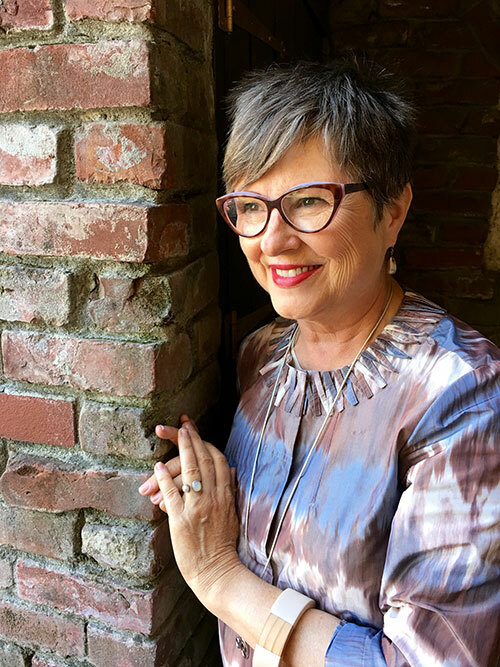 As I navigate through my ’60s, I’m noticing more and more that the universe has a way of guiding us to the places where we need to be. 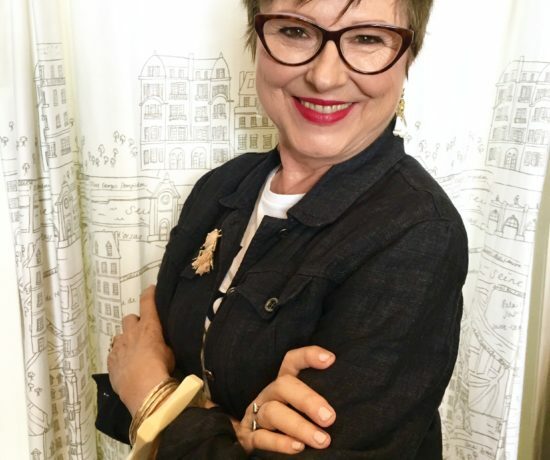 I love to read about women supporting women and this was a truly heartwarming story, and of course I love your styling explanations–the mystery of why all those smooth-surfaced earrings have been languishing unworn at the bottom of my jewelry tin has finally been solved! Yay, from the Phoenix VA! 🙂 A question — for the “color” exercise — do you ask someone to describe their favorite color, or a color that you give them? I like the idea of it, just wasn’t sure of the details. What a terrific way to recognize our women warriors. Good job Brenda!